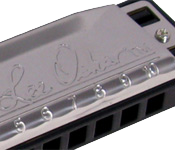 Blues Harmonicas have 10 holes with a single reed per note, which should be easy to bend. Tremolo models have 2 reeds per note, not designed to bend so easily, usually 24 double holes (making 48). The tremolo models are the ones used for traditional music in Britain and Ireland. Chromatic models usually have 10 or 12 holes, with a slider to provide all the semitones, similar to a B/C melodeon.